So when Maddie was picking with the guitar yesterday (in yesterday's picture) she asked "Is this the pick?" And while I didn't look, I thought she was asking me if that was what it was called, so "Yeah," I answered. "Well, how come it has teeth marks on it?" "Well, sometimes people put guitar picks in their mouth, but don't chew on it," thinking that we only have two, and don't want to ruin them. 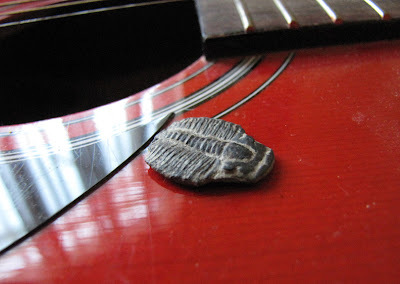 Late last night I found one of my precious trilobites on the floor (from a dig we did last year), and realized that she had been pickin' her guitar with my elrathia kingi. Not just anyone can pick a guitar with something about 520 million years old, you know. Now that is funny thanks for the laugh!